Rudy is Mr. Phony Baloney and will hold the title for a long time. 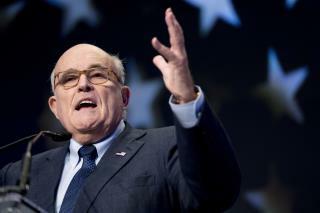 Rudy Judy esquire will say anything to defend his client, Trump. That means a lie really isn’t a lie. "We're children. You guys, like, are the adults. You need to take some action and play a role. Work together, come over your politics and get something done." — David Hogg, a survivor of the Parkland, Florida, school shooting. "David Pig is a crisis actor who didn't even go to Parkland HS. Sic guy or Worse"--- Donald Trump, survivor of Republican primaries.